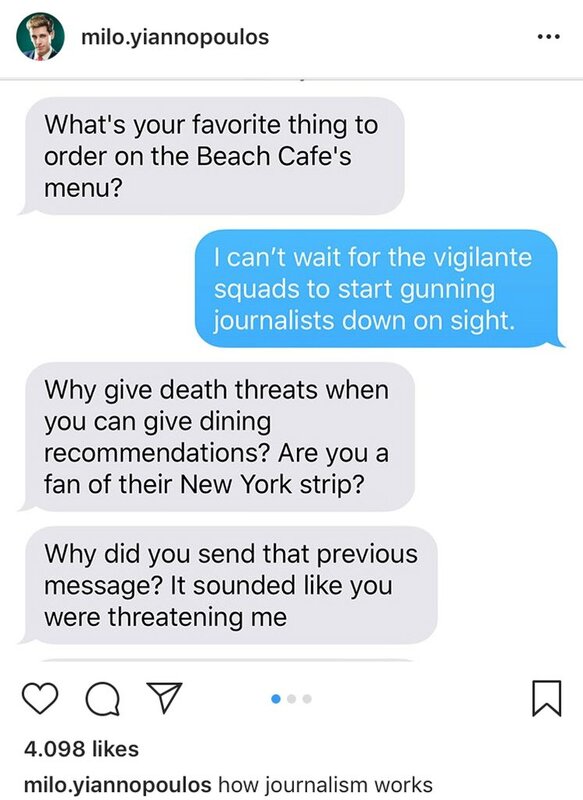 In response to a request from a journalist with regard to his favourite item on a restaurant menu, Milo Yiannapolous answered with this reply: “I can’t wait for the vigilante squads to start gunning journalists down on sight.” This idiocy went viral and was quickly exposed to a large (mostly disgusted) audience. Two days later a man took it upon himself to revenge himself on the newspaper staff that he believed had wronged him six years previously. 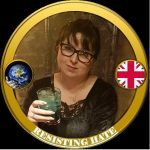 Five innocent journalists were shot dead in Maryland, USA. To any decent human being this atrocity is about the victims, the families of the victims and the survivors. 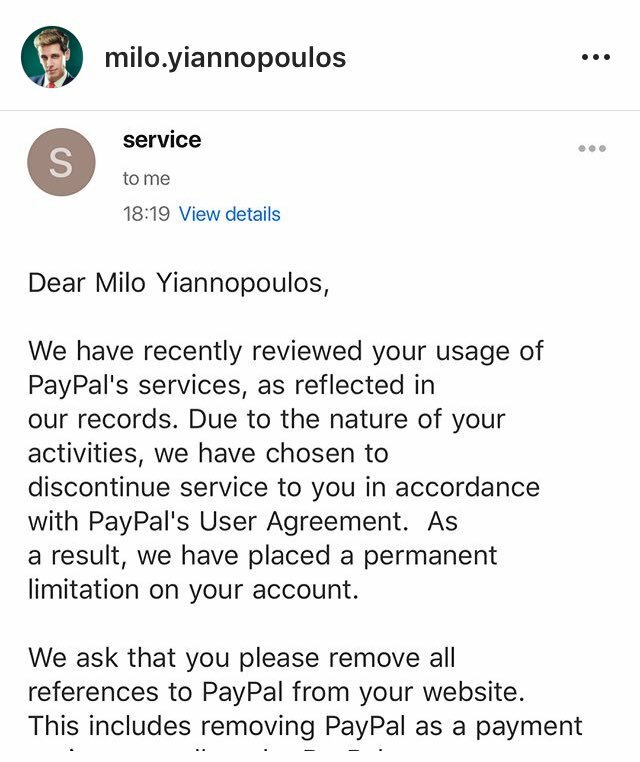 But to Milo Yiannapolous this was yet another opportunity to be the centre of attention. 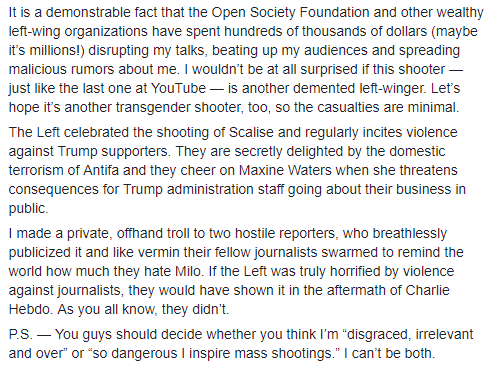 In his statement which he supposedly released to vindicate himself, Yiannapolous manages to admit that he finds the death of journalists amusing (he refers to his comment as a ‘joke’), he managed to insult the transgender community by hoping that the shooter (at the time of his statement unnamed) was a ‘transgender shooter’ and he accompanied the post on his Instagram account with this offensive picture of himself holding a gun. 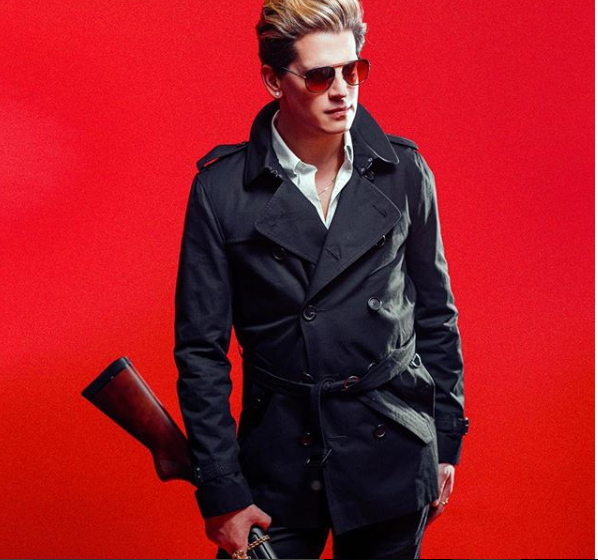 And followed it up with another picture of him with a gun. Just so there could be no doubt whatsoever about what a berk he is. 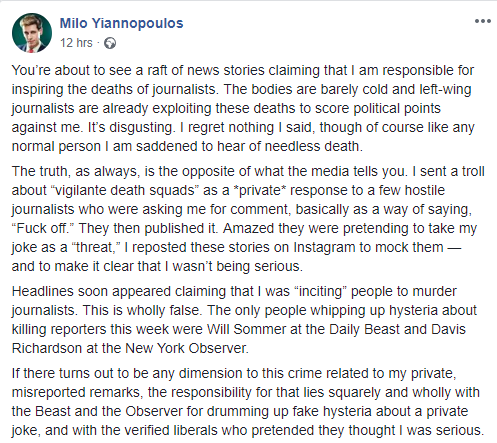 Speculation is rife on the internet as to how UKIP (which Yiannapolous joined 22.6.2018) feel about their new pro murder poster boy. 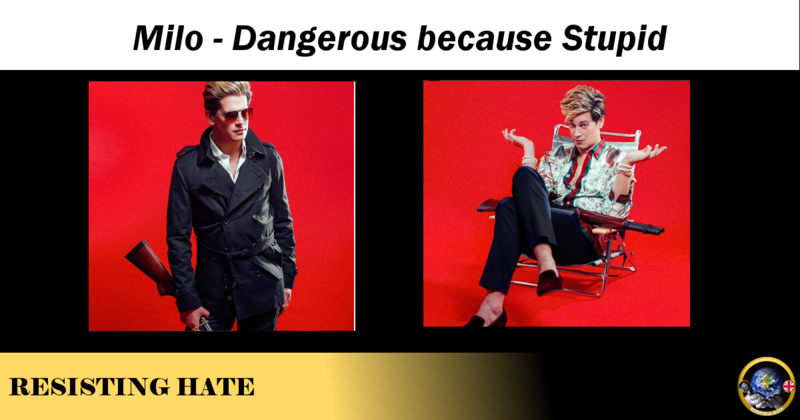 The backlash against Milo has justifiably already started. 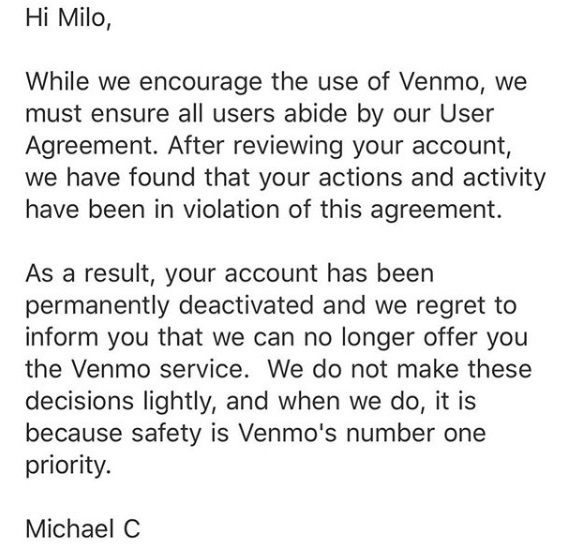 Venmo closed his account. 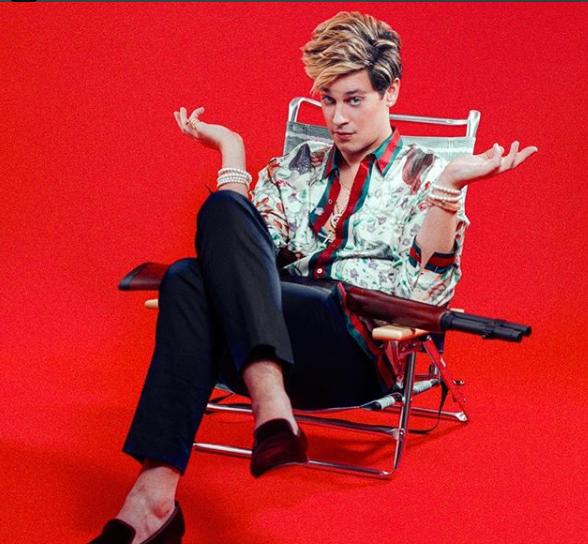 How does Milo still have a Facebook account? 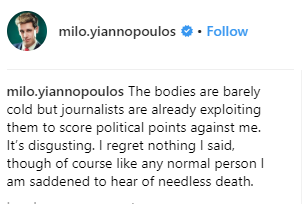 Milo asks in one of his posts above if he is disgraced or ‘so dangerous’ he inspires mass shootings. 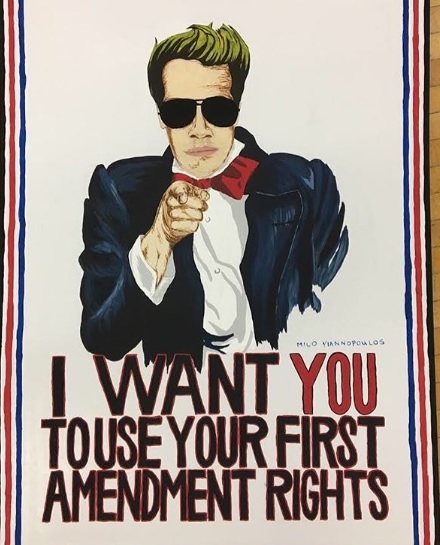 You are both Milo. 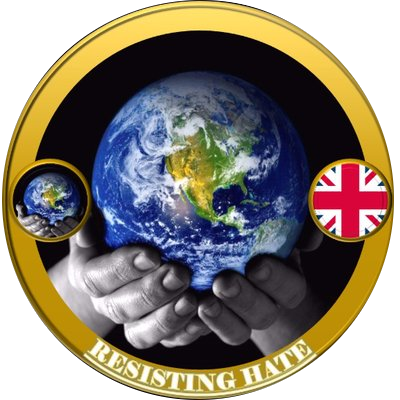 You are an utter self delusional, weak minded moron but unfortunately the people who follow you are even stupider than you are and therefore likely to be inspired by your idiocy. Hopefully we will not have long before this sad little attention seeker is consigned to the scrapheap of obscurity.